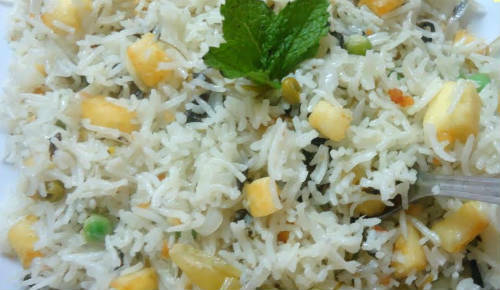 A delicious pulao made with paneer and white chickpeas. Perfect lunch or dinner with choice of raita or side dish. White Channa (Chickpeas) – 100 gms (dry), soaked overnight or 8 hours. 1. To make the masala paste, blend the ginger, garlic, chillies, coriander and mint leaves in a blender with very little water to a fine paste. 2. Cook the chickpeas in a pressure cooker until soft. The number of whistles may vary from cooker to cooker. 3. Wash the basmati rice 2 to 3 times or until clean and soak it in water for 30 minutes. 4. Drain the rice well. 5. Heat ghee in a pressure cooker. 6. Add bay leaf, cloves, cinnamon, cardamom and jeera and fry for 30 seconds. 7. Add onions and fry until golden. 8. Now add the paste mentioned above and stir for another minute until the raw smell disappears. 9. Add the chopped tomatoes and stir for another minute. 10. Now add the turmeric, chilly powders and garam masala and curd and stir well. 11. Add the chickpeas and rice and salt as required. 12. Add 2 cups of water and stir to mix well. 13. Once it begins to boil, cover the pressure cooker with a lid. 14. Reduce the heat to Low – medium flame and let it cook for around 15 minutes. 15. Switch off the flame and remove the lid once the pressure has reduced. 16. Fluff up the rice with a fork. 17. Heat some oil in a pan. 18. Fry the paneer till the edges become golden brown. 19. Add the fried paneer to the rice and fluff again. 20. Garnish it with coriander and mint leaves. 21. Serve with raita of choice. 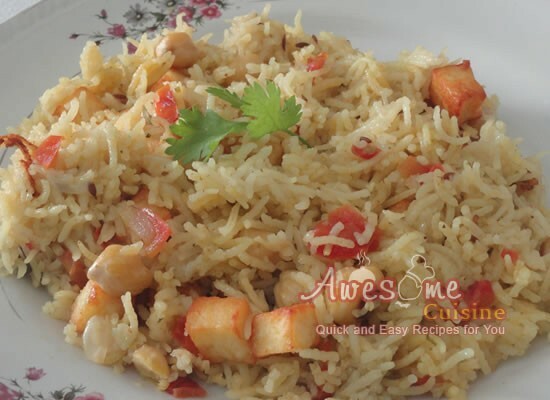 Feel free to comment or share your thoughts on this Paneer Channa Pulao Recipe from Awesome Cuisine.